Tired of feeling clueless at the mechanic? Maybe your car is making an odd noise it never used to or can’t stop on a dime anymore. While these problems are common, most car owners find themselves woefully unprepared when it comes time to face the music and bring their baby to the shop. But what if you could know what the problem was before your mechanic? With the Spiffy Blue Onboard Diagnostic Sensor (OBD), you can walk in with confidence and not walk out broke. A check engine light is never good news, but being aware of what’s going on under your hood can reduce your stress greatly. 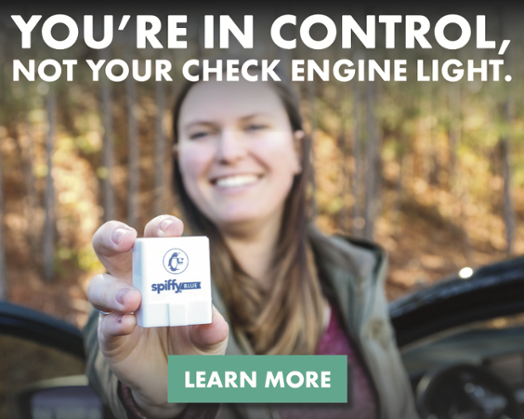 Instead of just getting a generic check engine light, Spiffy Blue reads the specific code and tells you what's happening. No vague lights or confusing jargon -- just info about your car, when and where you need it. Contrary to the negative stereotypes, many mechanics are honest business people who want happy customers. However, if you’re not so lucky, being armed with a little information can go a long way. Avoid unnecessary repairs and make sure that your car is getting only the right maintenance at the right time by staying on top of problems before they become problems. For those who are able to perform some DIY car repairs at home, an OBD sensor like Spiffy Blue can keep you out of the shop altogether, allowing you to save money on costly repairs unless absolutely necessary. And even if you can’t fix it yourself, Spiffy Blue will allow you to make better-informed decisions without feeling put on the spot, allowing you to do your own research before you bring it in. Spiffy Blue isn’t like other OBD sensors, it pairs to your phone and uses the Spiffy app to keep you up-to date on everything happening with your car. Schedule maintenance with helpful push notifications, learn about factory recalls and other important updates, and stay informed about potential issues as they arise. Spiffy Blue is not just affordable, but gives real insights that can save you thousands in the long run. Want to stay in control when the dreaded check engine light switches on? It all starts with a simple scan. Act today to be on the first 1,000 drivers accepted in our early access program.